The released next Moto Z3 mobile phone appeared on the globe on April 25th in a single 2-sided render. 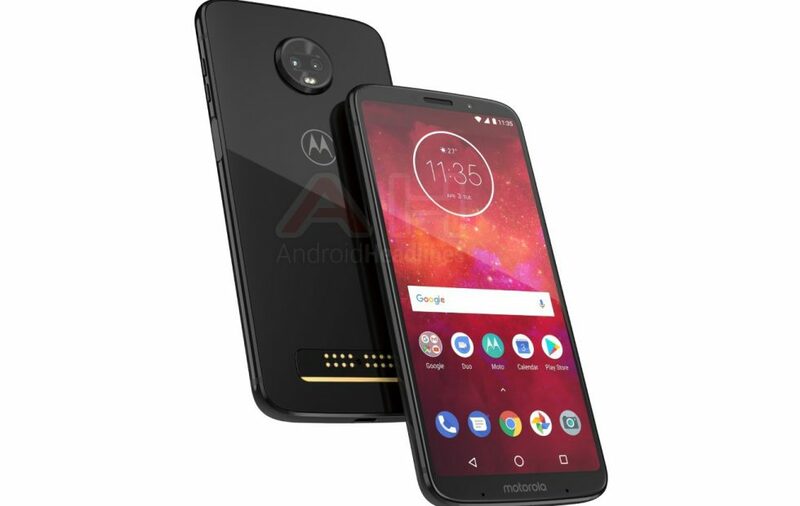 The image showed the front and the back of this Moto Z3 device, in the third-generation smartphone in a line of plug-and-play modular smartphone devices. This device will likely be shown officially by Motorola and/or Lenovo very, soon! This mobile device is rumored to roll with a 6-inch Super AMOLED touchscreen with 1080 x 2160 pixel resolution. That’s with a 2:1 ratio (18:9 they say) with Corning Gorilla Glass 3 on top. This is a slight adjustment from the Moto Z2 that had a slightly more traditionally-shaped display – this one’s corners are a tiny bit more round. This mobile device likely has Android 8.1 Oreo or later on it – or will when it’s released. The processor was not so cleared to be a Qualcomm SDM636 Snapdragon 636. That would have an Octa-core 1.8 GHz Kryo 260 CPU and an Adreno 509 GPU onboard. Along with said processor, this device was rumored to come with two possible combinations of internal storage size and RAM. On the version was tipped as having 32GB in the internal storage memory and 4GB of RAM. The other was said to have 64GB of internal storage and 6GB of RAM. If this device has what its predecessors had, it’ll have a microSD card slot to hold up to 256GB of additional media. On the back area of the mobile device, we’re likely looking at 2x 12-megapixel cameras with (f/1.6) + 8 MP, phase detection and laser autofocus, and a dual-LED dual-tone flash. This device also has the same connection hardware provided with previous Moto Z devices. That means the mobile device can handle and be able to run all Moto Z MotoMods!